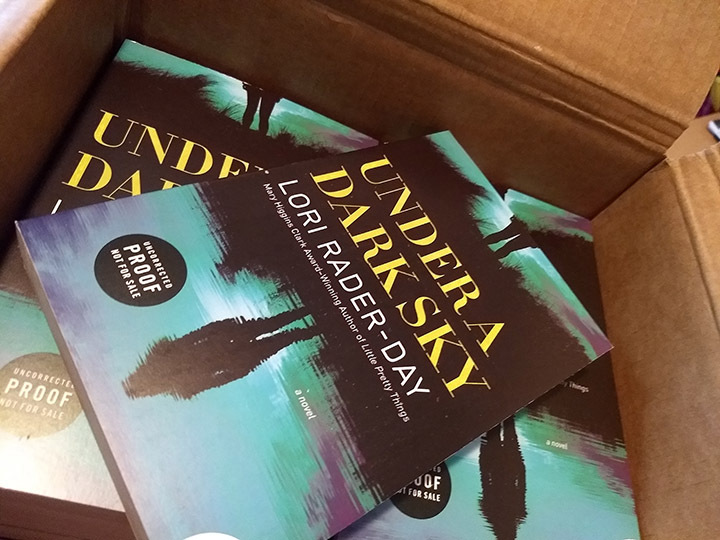 Under a Dark Sky advance reader copies arrive! And then one day all those ideas are delivered to your front porch in pretty, paper form. These are the advance readers of Under a Dark Sky for reviewers, so NO ONE PANIC. If you are a librarian or reviewer, you can use Edelweiss to request it. Go do that. I’ll wait. If you’re not a librarian or reviewer but a reader and super excited about the book, you can pre-order from your local independent bookstore or from the major retailers. Or you can wait until August 7 and maybe come to one of my launch events? I should start planning some of those, huh? Yay! It’s never a bad day when a book you wrote finally shows up looking like a BOOK. Thanks for your enthusiasm about this book. My experience is that each book is its own challenge and its own reward. This one is special to me, and I hope you love it.